Posted on Saturday, February 6th, 2010 at 8:33 am. We proudly present the annual Lunar New Year celebration of the Taiwanese American community and invite you to join the 2nd Generation Program highlighting the theme “Projecting Our Presence” as it applies to media, representation, and our own personal paths. We are proud to host this special event featuring the production team and actors behind the upcoming Hollywood motion picture FORMOSA BETRAYED! A political action thriller set in 1980’s Taiwan, it follows a web of intrigue and surprise through the eyes of an FBI detective (played by James Van Der Beek of Dawson’s Creek) assigned to investigate the murder of a Taiwanese American professor and gives a glimpse of a democracy movement that shaped this island nation. Starting the weekend of Feb 26-28, FORMOSA BETRAYED will begin opening in theaters nationwide! We are proud to present producer/actor Will Tiao, director/producer Adam Kane (Heroes), associate producer Jon Lee, actor Tzi Ma (Rush Hour), actor Adam Wang, and actor Henry Chu at our gathering. 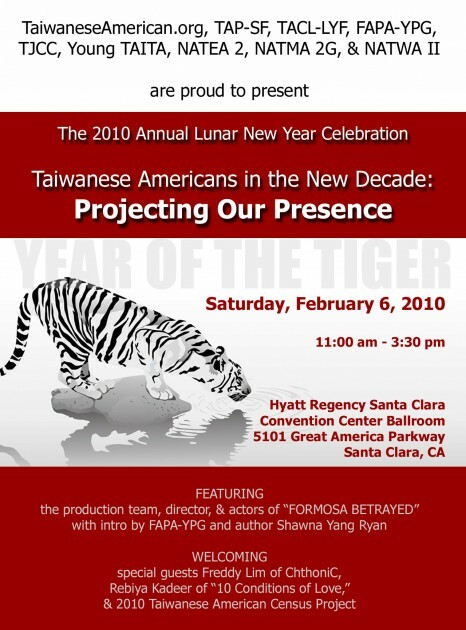 The event will be preceded by brief presentations on the history of Taiwan upon which the movie is set and an introduction by author Shawna Yang Ryan discussing Asian Americans and our emergence in the media. We are also honored to welcome special guests, Taiwanese metal star Freddy Lim of ChthoniC who is single-handedly inspiring a new generation of Taiwanese youth identity, and exiled Uyghur activist Rebiya Kadeer, subject of the 2009 award-winning documentary film “The 10 Conditions of Love.” Following the presentations, Q&A, and photo opportunities, we will host a young professionals and collegiate networking event focusing on how we as Asian Americans can project our presence in various careers and in the community. Join us for this annual celebration of the Taiwanese American community as we highlight how far we’ve come and our hopes for the new decade! This is the event you don’t want to miss!